An okay movie that consists of one ongoing joke about these two guys stuck together, trying to get home, and one of them being incredibly annoying to the other. 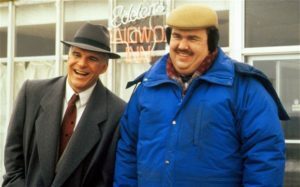 The thing about Planes, Trains, and Automobiles is that it worked back when it came out because audiences were willing to watch these two actors do just about anything. 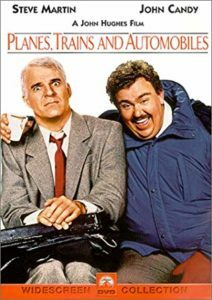 But unlike What About Bob, another movie about a character who does everything he can to annoy the other, that movie took the idea and surrounded it with a clever story involving a small town and vacation house. Planes, Trains, doesn’t do that. Instead, it has one note to it. One simple plot line. These two guys are traveling in any way possible, trying to get home. But here’s the thing. They are strangers. They meet on the plane for the very first time. So there is no reason why they would feel forced to spend nearly the entire movie together. And that’s exactly the problem. The situation and overall plot are build on some pretty ridiculous ideas. Still, there are some decent laughs in here, mostly at the hands of Steve Martin, who is so great at playing angry and annoyed. Planes, Trains, and Automobiles is a funny, light-hearted movie. It’s also the kind of movie that could only have been made in the eighties. There’s a reason why this one hasn’t been remade, even though the formula might be so simple and seemingly easy to redo. The story of two strangers being stuck together for days, trying to find different ways to travel home, just wouldn’t hold water. There’s no way these two guys would spend the entire movie together and truly be unable to get away from each other. It’s even pretty hard to believe it all, here, in the eighties. But we roll with it for the time, and get a few laughs along the way. To the movies credit, both of its lead actors are perfectly cast. Steve Martin, in particular, is so great at playing that sort of average joe who everybody can relate to, and yet who is clearly filled with pent up rage. And this movie showcases that persona very well. Martin plays Neal Page, a businessman who is in New York for a final meeting before flying home to his family in Chicago for Thanksgiving. And he has a long and tiring road ahead of him, in order to get there. When we first meet Page, he is sitting in a meeting where his boss is looking over the advertising concept art proposal that he and a coworker have put together. Only the boss can’t decide on whether he likes it or not. And without any spoken words, we watch as the boss goes back and forth, looking over the art, and then preparing to say something, before stopping to go back to looking at the art. And all the while, Page is clearly getting frustrated, in a rush to leave the meeting, get to the airport, and hopefully make his flight. When he finally does make it out to the street, it’s a zoo of angry, tired people fighting to get cabs. Page sees one available at the end of the street, but another guy on the other side of the street sees it at the exact same time. And so it’s a race, jumping over things, dodging obstacles, and doing whatever it takes to get to that cab first. And in the end, it’s a poorly placed gigantic trunk that Page falls over, which loses him the cab. The last thing he sees before the cab drives away is what it says on that trunk. The trunk will resurface again in the movie. Those first two scenes are terrific. They are all Steve Martin and they work because of relatable circumstances and physical comedy. They are also two of the better scenes from the entire movie. And it should be noted that John Candy isn’t in either one. Candy is a fine actor, but the difference between his level of comedy and Martin’s is that Martin’s comedy can still hold up today. What Candy was doing feels very dated. When Page finally does get to the airport, he is relieved to see that his flight has been delayed. And so he makes it on board and is all ready to settle in and relax, thinking the worst is behind him. That’s when the person sitting next to him starts talking. This is Del Griffith (Candy,) and he refuses to stop talking, no matter how disinterested Page acts. When the plane hits turbulence, they have to land in another state, and spend the night there until they can possibly get on another flight the next day. Page calls home to tell his wife what’s going on. Del calls a motel and books a room. By the time Page is off the phone with his wife, all hotel and motel rooms in the area are booked. That’s when Del comes by and offers Page that he can tag along. Del says he knows the owner of the motel and will be able to get Page his own room. It’s either that or Page stays at the airport and sleeps on the floor. Now here’s where the movie starts to lose believability. Considering how annoying Del has been so far, there is absolutely no way that Page would go along with him. And on top of that, whats so terrible about sleeping at the airport anyway. You sleep in a chair, not on the floor. Or you don’t sleep at all. When they get to the motel, there’s a pretty funny surprise waiting for these guys. There’s only one room left, that they both have to share. And as if that isn’t bad enough, there’s only one bed. At that point, one of them should grab a handful of blankets and sleep on the floor. But here, they decide to both cuddle up in the same tiny bed. Understandably, this is for pure comedic purposes, but realism has gone out the window a long time ago, at this point. And the sharing of a bed scene is the most iconic scene of the movie. It’s also the strangest. Of course Griffith makes all sorts of noises and is incredibly annoying, and of course Page can’t get any sleep. For every moment that doesn’t work, there are others that do. So, for example, in a clever plot twist, the men are robbed, and Page suspects that Griffith is the one who stole his money. That leaves the guys without a nickel to get home. So Griffith starts selling shower curtain rings by pawning them off as a new fashion in earrings. This is one of the dopey ideas. The robbery one, however, was pretty good. And then we get a scene of the guys on a bus with a bunch of strangers, and Griffith leads everyone in singing songs. It’s another ridiculous and annoying scene. Eventually the men do split up, even if it’s just for a short amount of time. Page rents a car, or so he thinks, and takes a bus out to the parking lot to pick the up the vehicle. Only when he gets out there, the spot is empty and the car is already gone. Now he has to wait for another bus or walk it, just to get back to the rental desk. And by the time he does, Page is in full anger mode. But he and Griffith end up back together again, when Page is punched out and Griffith drives up in time to grab Page out of the street. The movie is basically a series of situations like this, one after the next. It’s enjoyable, but also, at times, a little tiring. There’s only so much you can take of watching a movie about one guy constantly annoy the other one. This movie doesn’t seem to understand the limit. It basically repeats the same joke for the entire film. Luckily, there’s a little twist at the end to help keep things interesting. The movie is okay, but it’s hardly anything smart of hilarious.